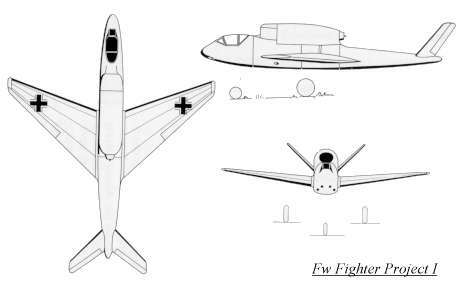 This was the first of a series of designs from Focke-Wulf in 1942 for a single-seat, single-jet engine day fighter. 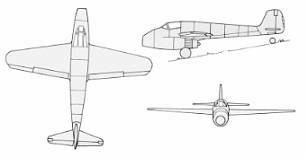 This aircraft design featured 30 degree swept-forward wings and a V-tail. The turbojet was mounted on the top of the fuselage behind the cockpit, such as the later Heinkel 162 utilized. Several versions were designed, amoung them one with a Jumo 004 turbojet and one with a BMW 003 jet engine. Armament was to be two MK 108 30mm cannon and two MG 151 15mm machine guns. One of the more interesting things about this project was that it was probably one of the first to be exclusively designed as a single-jet fighter.